Based on the late 1960 Plain Enamel Jazz Bass Pickups, my Custom Handwound Classic '60 Replacement Pickups have that tighter, punchier sound with great clarity, definition and a tighter bass response - great for cutting through the mix or band set-up. The Neck pickup is wound with RW/RP for humbucking in the middle position. Wax potted with vintage cloth wire, a great classic sounding, replacement Jazz Bass Pickups. 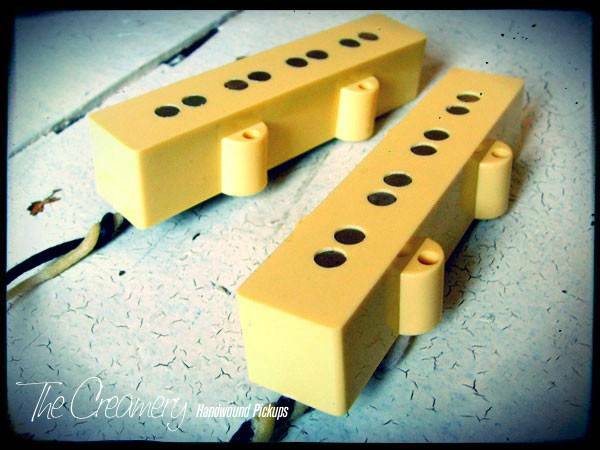 You can find more details of my Creamery Custom, Handwound Replacement Jazz (J) Bass and Precision (P) Bass Pickups here.